Parra, Dutch Artist | Arkitip, Inc.
Dutch artist Parra (1976) is best known for his curved post-Pop imagery, highly saturated colours, vibrant hand-drawn letters and worlds inhabited by hybrid, surreal characters. Celebrated by galleries and championed by an underground following from the outset, Parra has quickly become a respected and eclectic artist worldwide. Working across drawing, painting, animation and sculpture, Parra creates an enigmatic and instantly recognisable style that defies easy categorisation. Parra is cofounder of cult apparel label Rockwell Clothing and a member of electronic music group Le Le. 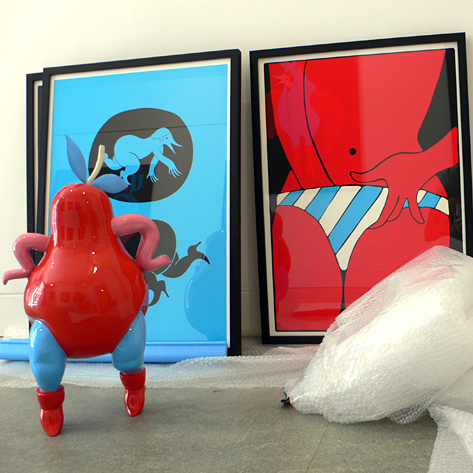 Parra Lives and works in Amsterdam, The Netherlands. We will be updating with available work soon.